A Cosmetic Dentist in State College Can Boost Your Confidence! Did you know it takes just 12 muscles to smile and 113 muscles to frown? Smiling is physically easier than frowning but for some, grinning is something to be avoided. People all over the world hide their teeth due to flaws in their smile. If this sounds like you, don’t worry! You’re not alone. 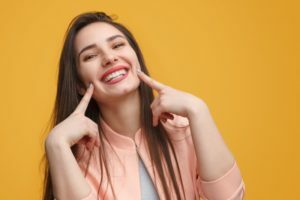 Many are turning to cosmetic dentistry to make their smiles look beautiful, while boosting their confidence and self-esteem at the same time. Keep reading to learn what your cosmetic dentist in State College can do to boost your self-confidence. This service has quickly become the most popular cosmetic dentistry treatment. Teeth whitening is easy, low cost, and patients can achieve dramatically whiter and more youthful looking smiles as quick as one visit to their local dentist. This treatment is not invasive, and your dentist will use whitening gel to make your teeth up to 10 shades whiter! If your teeth are discolored to the point where whitening would be ineffective, or you have structural damage to your teeth, porcelain veneers are for you! These super-thin, tooth-colored shells are fabricated to fit over your teeth to correct a number of problems like worn enamel, uneven alignment, chips, cracks, and discoloration. Cosmetic bonding is a quick and easy fix to minor stains, chips, or cracks you may have in your smile that brings down your confidence. Your dentist will use composite resin on your teeth to sculpt and shape away any of your smile’s flaws. This is a great alternative to porcelain veneers and it can still last you up to 10 years. Have you been avoiding getting your teeth straightened because of the embarrassing and uncomfortable traditional braces that are required? Don’t worry, ClearCorrect treatment uses a series of clear plastic aligning trays that straighten your smile in the most discreet way possible. You can even remove them to eat! How Can These Services Boost My Confidence? After you fix and enhance your smile through the beautifying services above, you’ll be much more likely to smile. Studies show that people will perceive you as more confident and self-assure when you smile. Your new grin will also make you appear friendlier so whether you’re at work or in your personal life, people will be more willing to interact with you which boosts self-esteem. Your smile is something you can change and have control over, unlike other factors of your appearance. Talk to your local dentist today to see what you can do to look better, younger, friendlier, and above all else, boost your confidence! Dr. Donald M. Marks and Dr. John A. Martin enjoy being able to improve patient’s smiles and confidence. They both use continuing education courses to stay up-to-date on the latest dental techniques and technologies. Dr. Marks is a general dentist, while Dr. Martin is a periodontist so no matter what treatment you need, they’ll be able to help. They practice at Donald Marks Family Dentistry, where they can be contacted through their website or by phone at (814) 234-0329 for any questions. by: Dr. Donald Marks at September 28, 2018 . Comments Off on A Cosmetic Dentist in State College Can Boost Your Confidence!